Technicians can fix any PC problem - No Matter where you purchased your PC, OUR Technicians can help you. Service guarantee - If you're not completely satisfied with our service, the problem is remedied fast and free. No overseas phone calls - All Dell™ purchases with us are serviced under warranty here in Beatrice, Nebraska. Flat hourly rates - We remove the confusion by not billing different rates for different jobs. No time Windows. Just on time - When you schedule us for 2PM, we'll be there at 2PM. BT "Tune-UP" Much like an automobile, your computer will become slower and start to have problems if it is not 'tuned' regularly. Old temporary files and applications clutter up the hard drive, files get fragmented, and some applications can even spy on your surfing habits, and get in the way of your Internet access. A Blackburn Technologies PC “Tune-UP” will enhance your computer's performance, and make sure you're fully protected from security threats and viruses. While we're at it, we'll provide recommendations for how to make the most of the hardware and software investments you've made. Eighty percent of your computer problems can be prevented by having your computer regularly checked out. Come in for a "Tune-UP" Today and get it back tomorrow. 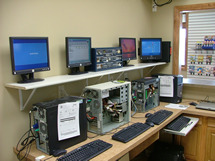 At Blackburn Technologies we have a state of the art service center, so that we can better service your PC. By having a large service area, we can work on several computers at a time, which will provide our customers with a much faster response time. We have also setup a customer service window that you can try out your PC or printer before you even take it home, so you can make sure you are getting what you paid for. You can talk to the technicans directly without having to walk into the tech room. Stop in anytime and ask for a tour of the new location at 110 Eastside Blvd. Suite B.